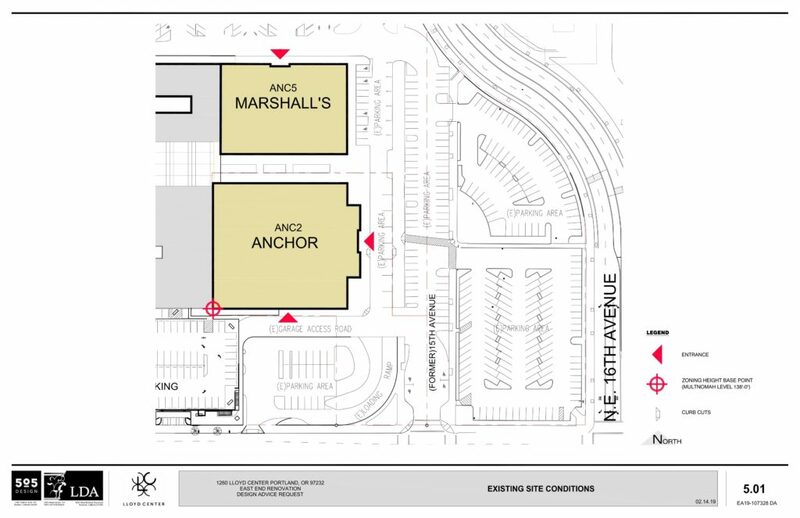 The existing east anchor building was built for JCPenney in 1960, and then later expanded by Sears. 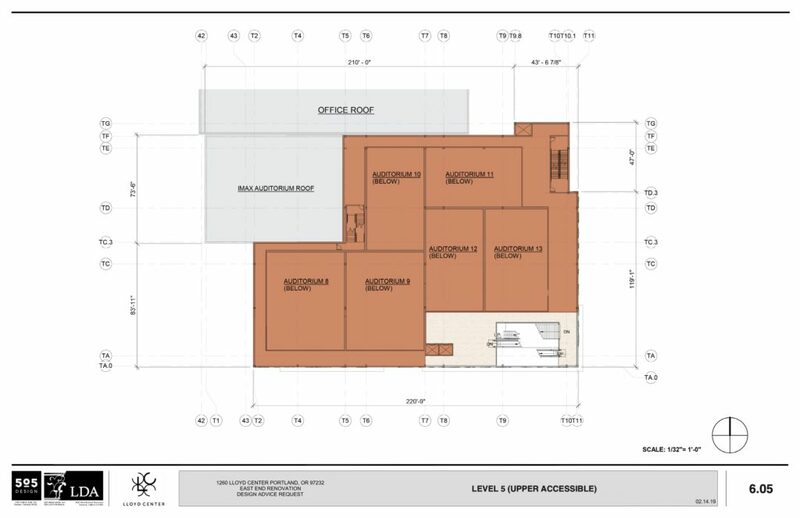 The sale of the Sears building to Cypress Equities, the owners of the larger Lloyd Center, was first reported by the Oregonian in November 2016. 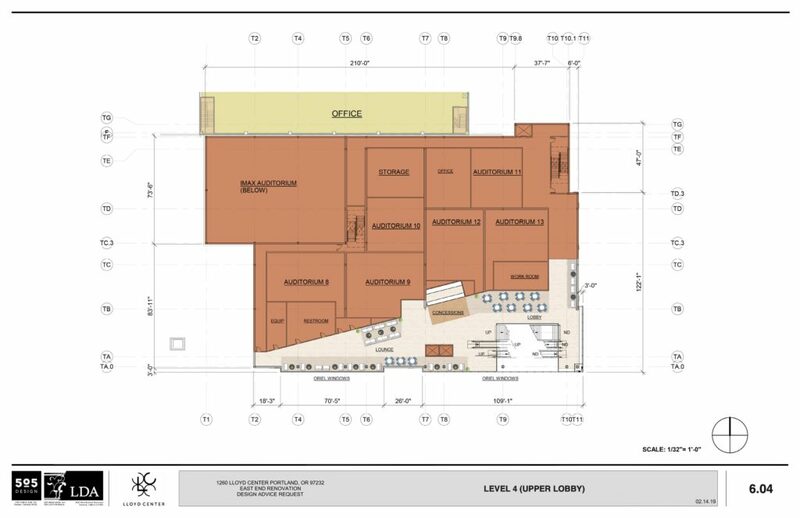 The theater addition is one of a number of recent and ongoing remodel projects at the Lloyd Center, including the new entry and plaza and the Live Nation Concert venue at the former Nordstrom location. 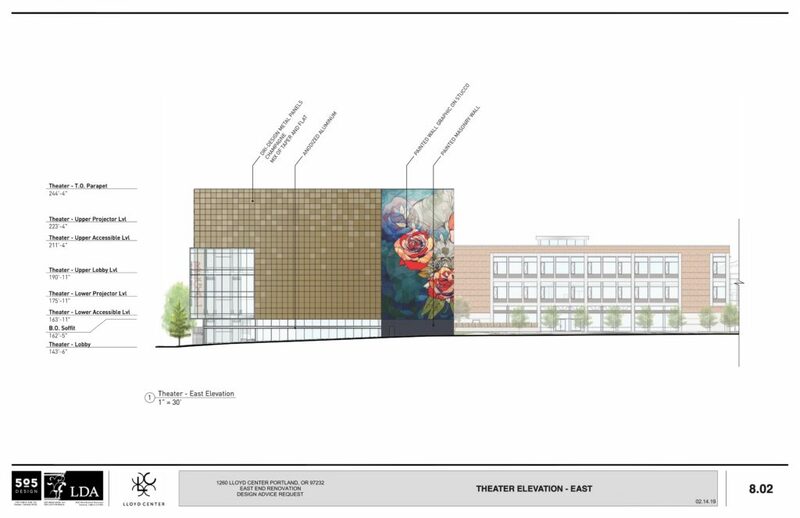 The new theaters will replace the existing cinema and associated parking, which is set to be displaced by the Byline development. 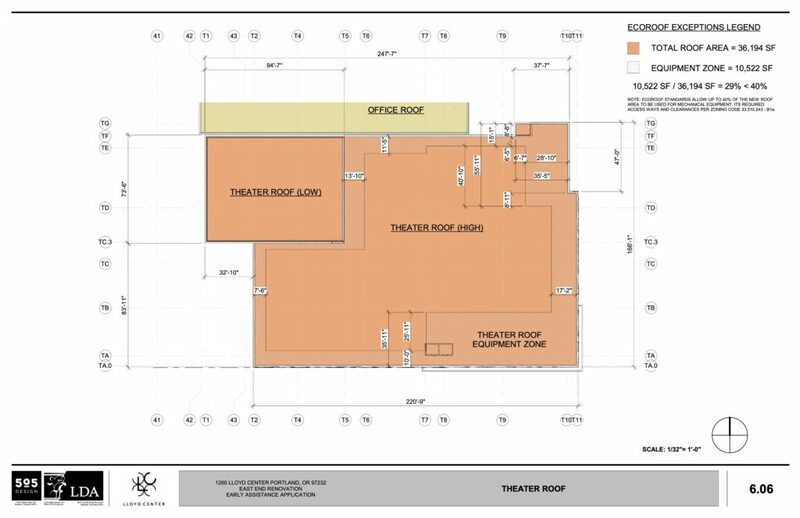 An earlier proposal for the theater addition was approved by the Design Commission and submitted for building permit, however the mall owners received feedback from potential tenants that the office space created in the former Sears building would have been too dark. 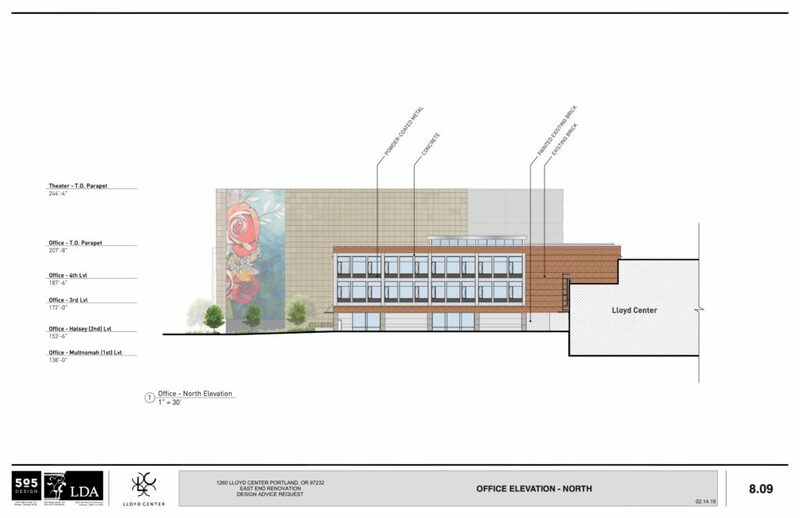 In the revised proposal, the new theaters would be located at the far southeast corner of the mall, adjacent to the existing anchor building. 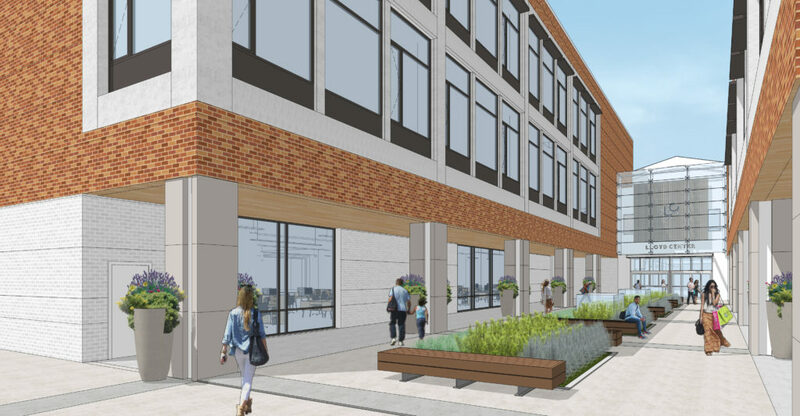 The original brick cladding on the anchor building would be restored, with new windows added to its north, east and west elevations. 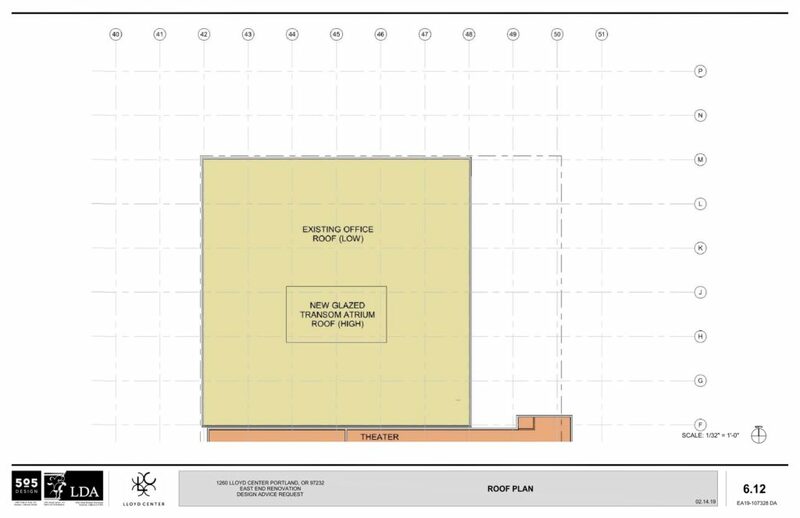 An atrium with a glazed roof would be cut through all four levels of the structure, bringing natural light down through the new office space. 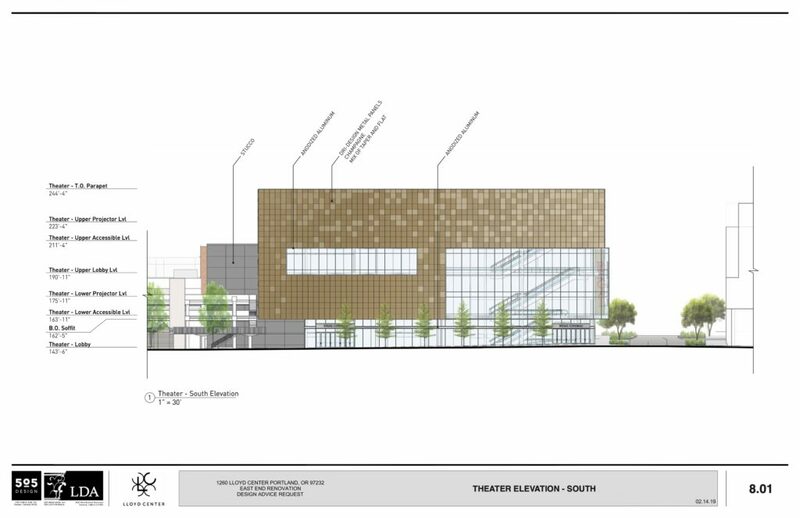 The theater addition would rise to a height of 106′-4″, with two levels of stacked theaters. 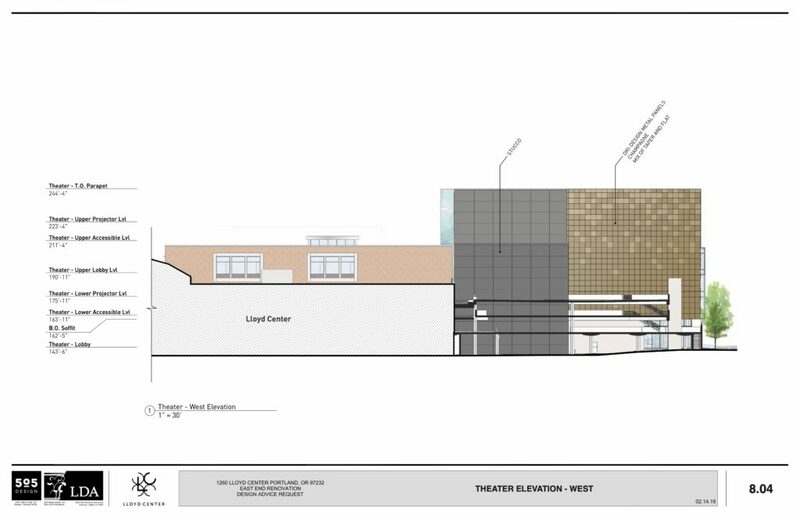 In keeping with the original proposal, the theater addition would be clad in Dri-Design metal panel, in a champagne color. 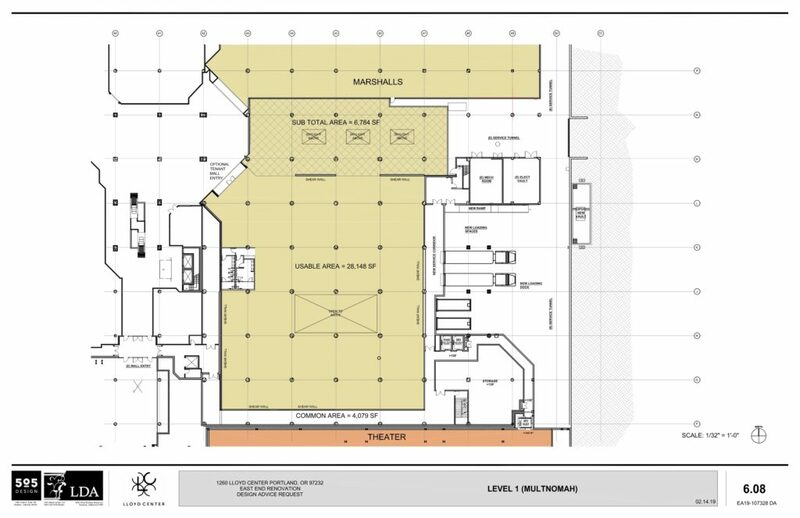 15% of the panels will be canted, creating a pattern designed to represent falling rain. 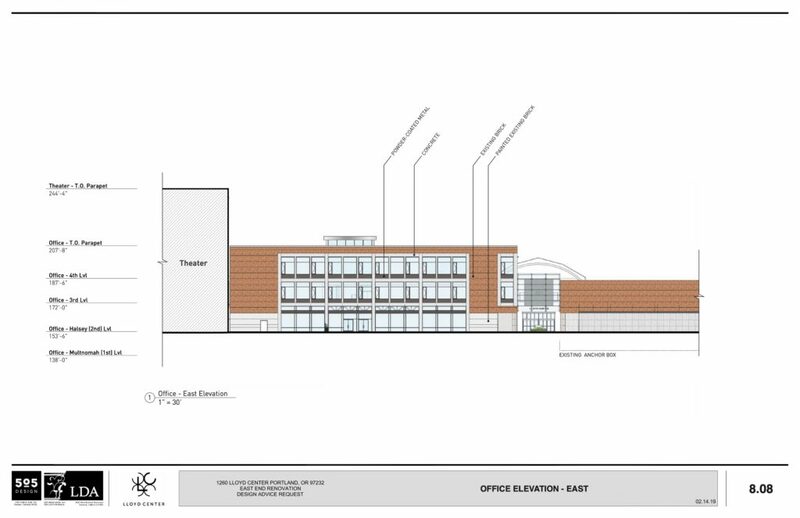 The revised proposal for the Lloyd East Anchor received Design Advice on February 28th, 2019. 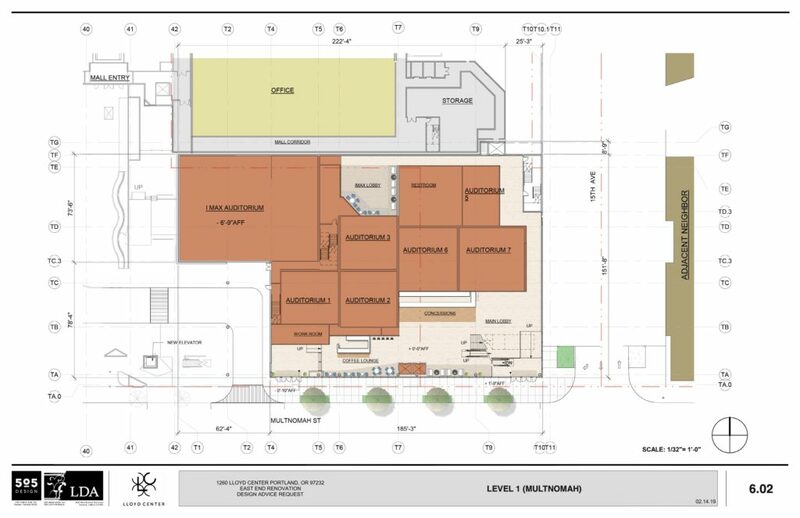 As noted in a summary memo, the Commission “supported the overall changes in design approach from [the] previous approved proposal.” Praise was given for the creation of a theater lobby directly fronting onto NE Multnomah St, instead of at the top level of the parking deck. 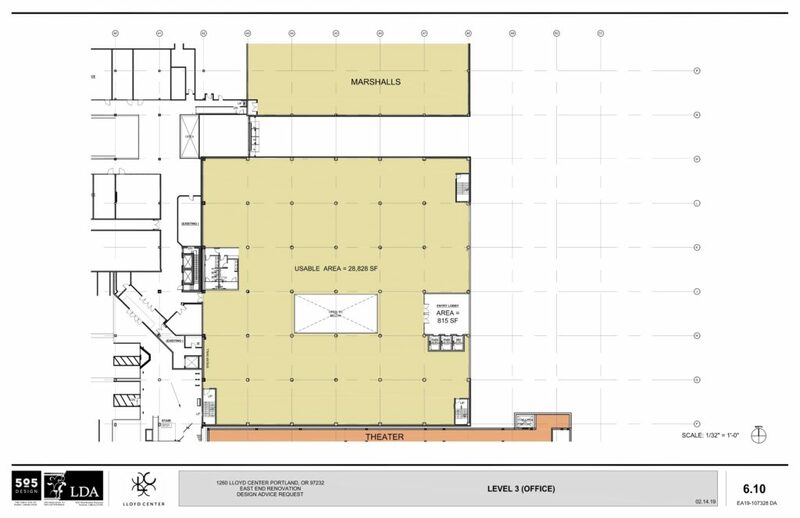 The Commission also reacted positively to the design of the new level 2 entry to the mall, between the former Sears and Marshalls spaces. 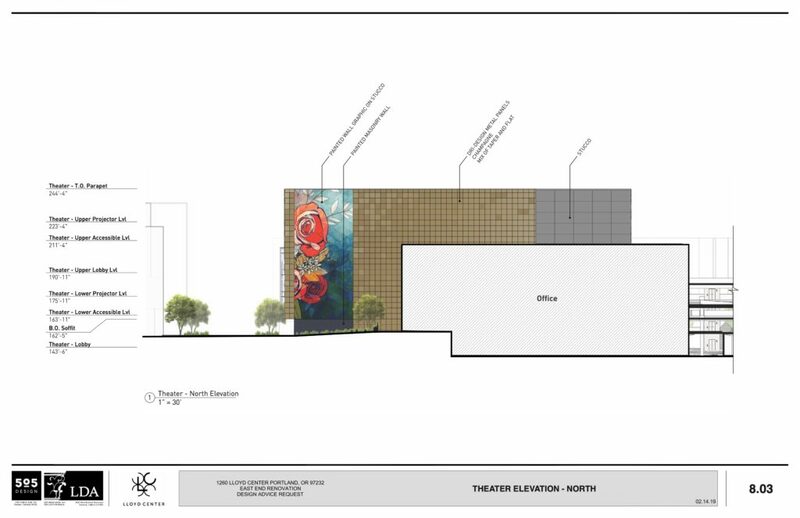 Areas identified as needing further design resolution included the stucco stair tower at the corner of the theater, conceptually shown with a rose mural, and the pedestrian realm along the east frontages facing NE 15th. 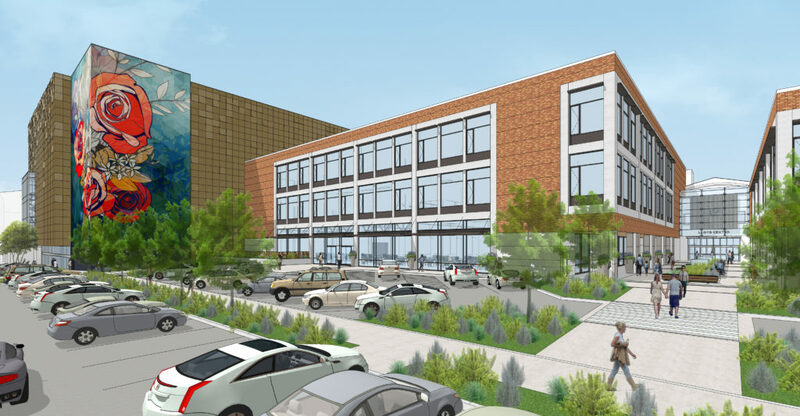 In order to gain approval the project will be required to go through a Type III Design Review, with public hearings in front of the Design Commission. This entry was posted in 505 Design, Cypress Equities, LDA Design Group, Lloyd District, Lloyd East Anchor Remodel. Bookmark the permalink. Gotta wonder if they’ll ever actually start building anything. 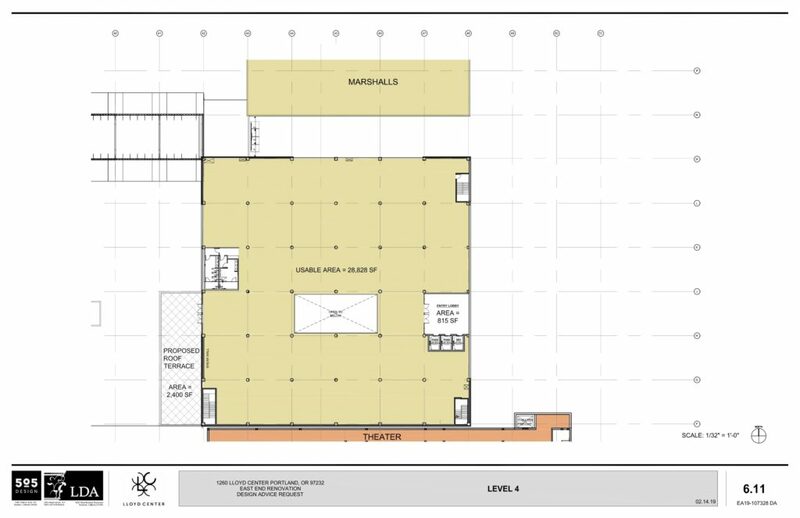 Lots of big plans and very little construction. 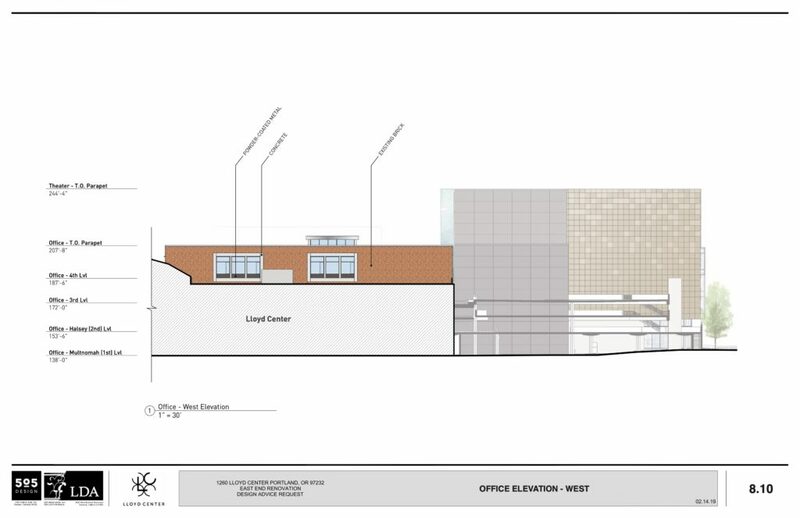 I think this is generally an improvement over the previous design, particularly in the pedestrian realm. 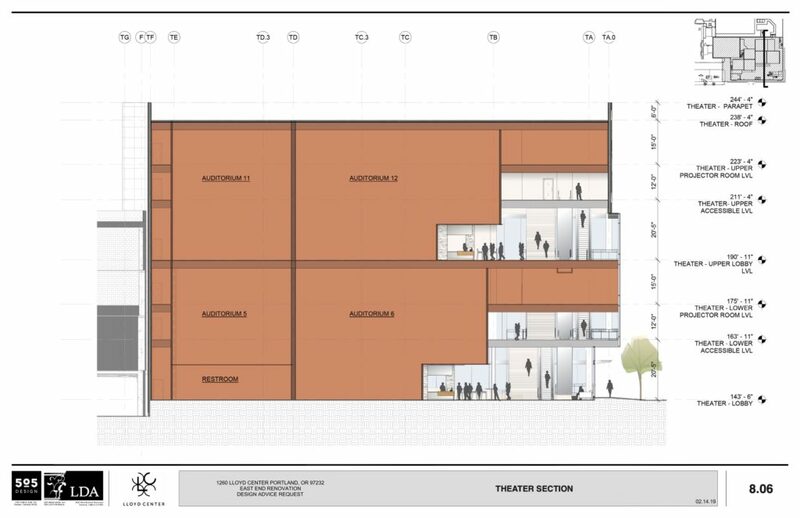 Bringing the theater down to the ground level and removing both the Level 2 parking access from 15th and the loading access from Multnomah should lead to a nicer experience accessing the theater. And 15th receives much more thoughtful treatment (even though it is getting a little more parking than the previous design). 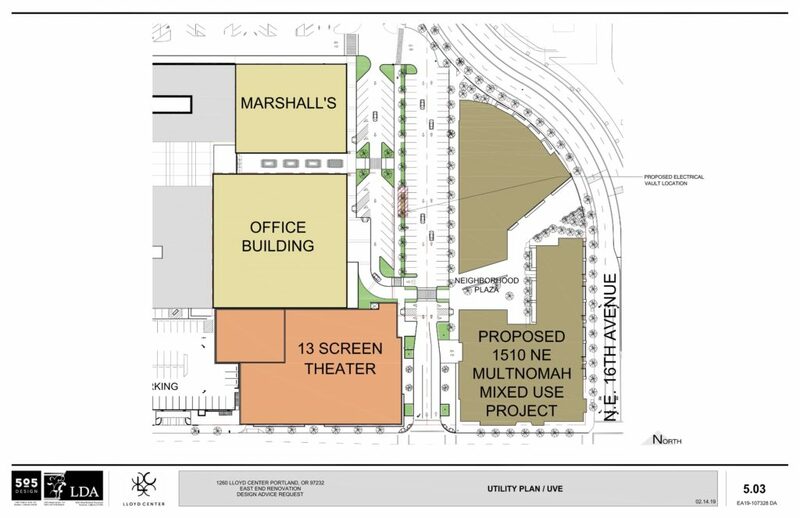 I do wish they would just remove that garage driveway from Multnomah entirely, and consolidate the garage access to NE 13th, though they clearly don’t really know what they want to do with the area around that mall entry. 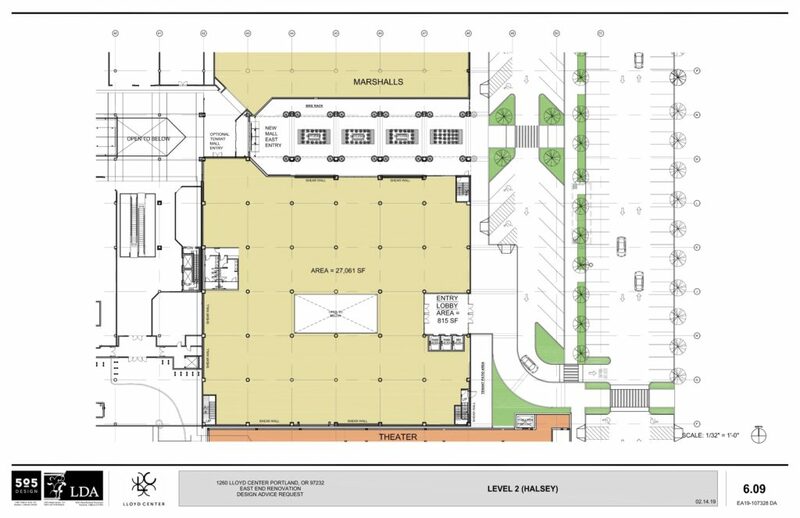 That driveway creates unnecessary conflicts and really isn’t needed once the theater goes in (unless they plan for that to be a valet/ridehailing area, I suppose). I commute with a bike to work. 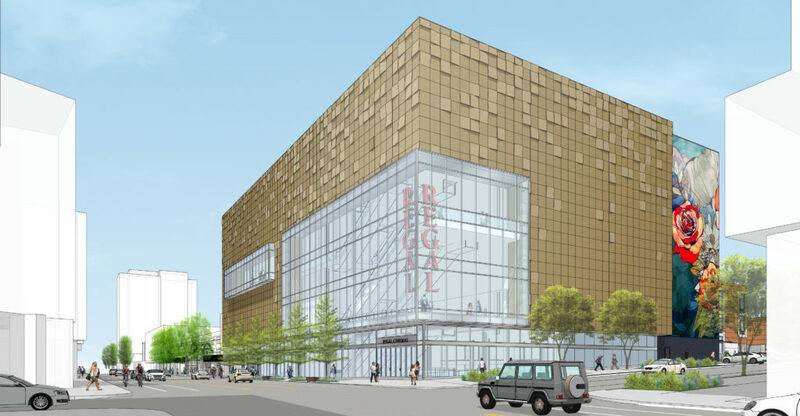 But I am cognizant that people drive cars…I see parking in the front: can people park in the general parking lot of the Lloyd Center, and is it far to walk to the theaters? 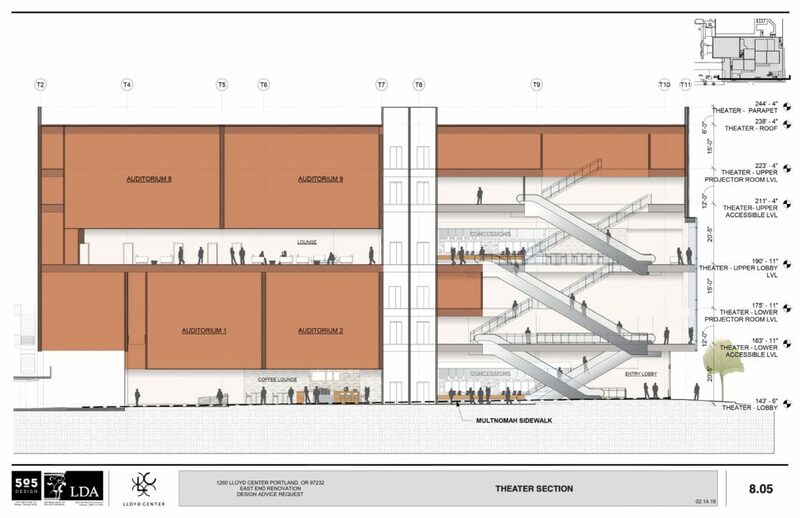 We will become a less car society…but today, today, people still drive and I wonder if thought was in this design, where one can park, walk a minimal distance and see a decent film. 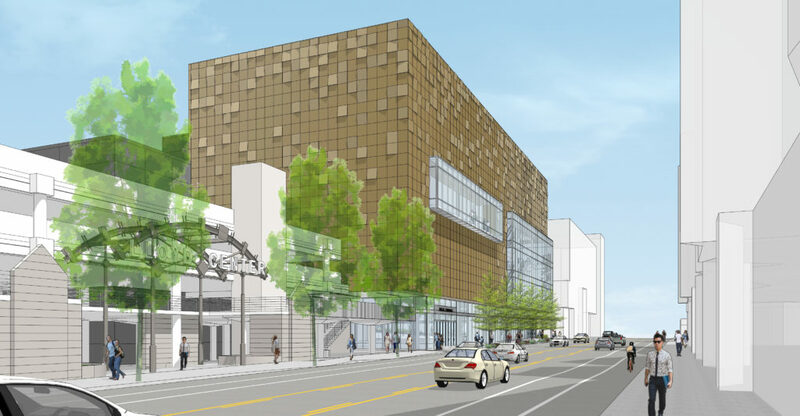 Make them dedicate 15th all the way down to Multnomah and then bring back parallel parking to that segment. 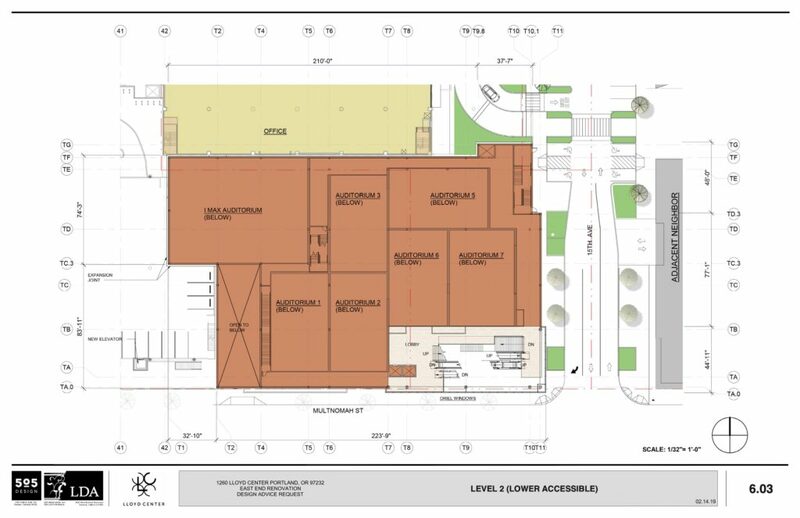 They need to move away from the super-block to make this area a nicer neighborhood.